Webmasters note: Its been so long since I put this page together that I can't remember where all of the illustrations came from. If you recognize any of them, please send me a note and I'll gladly credit the author or illustrator. Remember the 4:1 rule; The strength of the rope will be diminished when a bend in the rope is less than 4 times the diameter. Thus, most knots bend the rope at least less than this ideal formula. This is why strength degradation is applied when a knot is tied in any rescue rope. Also known as Full carrick Bend, Sailor's Knot and Anchor Bend. Beware! There are not many knots with so much wrong drawings as this bend. The ends have to be on opposite sites and the crossings always are alternating up/down/up/down... The Carrick Bend is one of the best knots. Ashley states it is possible the nearest thing we have to a perfect bend. It does not easily slip, not even if the rope is wet. And it is always easy to untie, also after a heavy load. If used as a Hawser bend in heavy material it is always seized and parceled to save wear. In the Macrame this knot is called the Josephine Knot. It is self evident the Josephine knot is not seized nor pulled tight. This is a very versatile knot most commonly used for attaching ropes to anchor points. Most things that can be done with fancier knots (e.g. double loop knots for a Y-belay) can also be done with a suitable combination of figure of eights. If you only learn one knot, make it this one. This can be used for tying a rope around a belay but is most often used for tying the end of a safety line rope around a person when belaying them up a climb or ladder. A good knot for belays or for tying rub points out of a rope. Its main advantage is that the two strands of rope emerging from the knot are at 180 degrees to one another rather than emerging in the same direction as in a figure-of-eight for example. This makes it a good mid-rope knot and good for belays because it has greater strength than a figure-of-eight if the belay fails. This double loop knot is most commonly used for rigging Y-belays. The nature of the knot means that it is reasonably easy to adjust the loops by moving rope from one of the loops to the other. This is another double loop knot suitable for rigging Y-belays. It has the advantage that is is a bit less bulky than the figure-of-eight on the bight. An excellent self-reversing friction knot suitable for belaying people when climbing or using a ladder. It can also be used for abseiling and gives a smoother ride than a stitch plate . This one is worth learning for all those occasions when you forget your Stitch plate or descender. This simple knot is very useful for when you need a rapid belay around an object or though a krab. The standard knot for tying two ropes together. If used in the middle of a pitch, a loop knot such as the figure-of-eight should be tied into one of the "tails" of the knot for safety during knot passing. The two knots that compose the double fisherman's should not be mirror images of one another (i.e. they should have the same "handedness") otherwise they won't stack properly. 1. Move center part (b) over right part. 2. Move new center part (c) over left part. 3. Move new center part (a) over right part. 5. For most satisfying results, remove hand before fairing or loading knot." 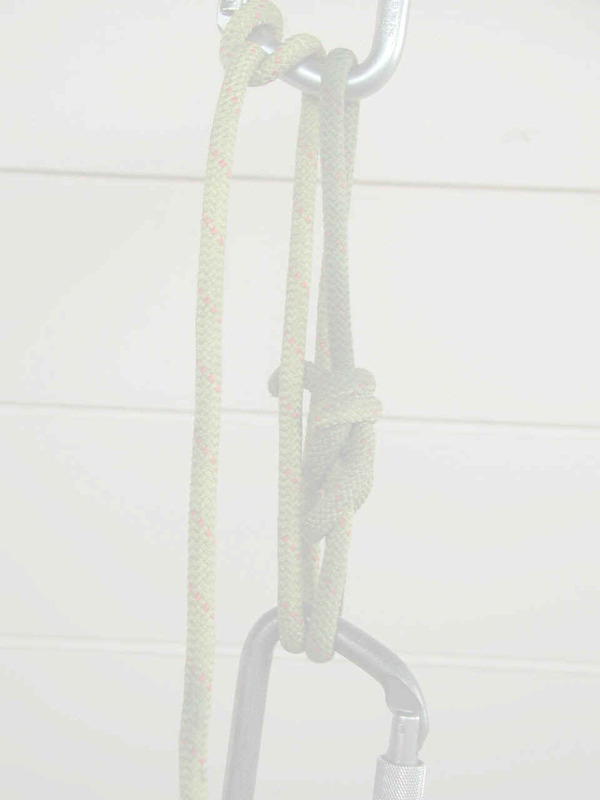 This knot is primarily used for tying tapes into slings for caving or climbing. The ends of the tape emerging from the knot should be secured to the tape loop using half hitches or insulating tape. This knot is tied so that the load bearing tape emerges from opposite sides of the knot so it will sit naturally when the sling is in use. Often used for securing a tape more securely around a stalagmite or column. The knot is weaker than just a loop of tape around the object, but it reduces the chances of the tape slipping off. A classic prussic knot is shown on the left, and a Kleimheist prussic knot on the right. Either of these, along with other prussic knots, can be used to prussic up a rope. The rope used for the prussic-loop should be a fair bit thinner than the rope to be climbed.